Thinking of leaving your job and wondering how to put in your two weeks notice? There are several easy ways to do it and this article will provide you with extra tips on how to cope during the “leaving stage”. 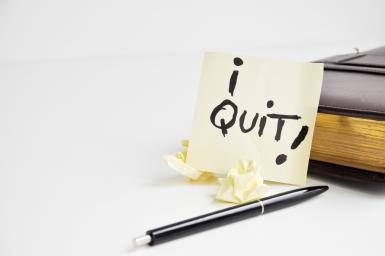 Handing in a letter of resignation is important because you and your boss will both have it in your records and it allows time for you to transition and your boss can quickly find a new replacement for you. No matter how hard you worked at your current work place, if you leave without handing in a notice, it will definitely be remembered. What matters the most is the impression you leave with people and in the worst case scenario, this act could have you blacklisted. Below are some things to consider when handing in your notice. If you know that you’re going to be leaving your current work place soon or relocating then inform your boss about your plans. The general rule is to give at least 2 weeks’ notice before leaving officially. Alerting your boss that you are leaving and giving him or her enough notice will allow them to find your replacement. It will make the transition much smoother. Talking to your boss before handing in you resignation letter shows professionalism which is good on your part. Have a brief chat with your boss and let him or her know that you are going to hand in your resignation letter. By doing this, your boss and other colleagues won’t be so shocked by your decision. Also, showcasing professionalism in this way can help you get a more positive reference. If you are resigning because you hate your boss or dislike your workplace don’t use your resignation letter as an opportunity to vent. Instead, keep it friendly and depart on good terms, as it’s more professional. During the discussion with your boss when you are asked why you want to leave, don’t start badmouthing the company or your experience, instead say that the new job offer you were given is a great career move for you. An employee who decides to move on is likely to be of no surprise to your boss. Although you might have gotten along with everyone in your place of work, you may have been close to one or two people or they may have played an instrumental role in your success at work. Thank them verbally or leave them a personal note expressing how appreciative you are of them. You could thank your boss too, regardless if the both of you had a strained relationship. Write a little note showing appreciation. You don’t need to lie or be pretentious but just keep things positive. Informing your boss that you plan to quit is best done on a Friday because it gives both of you the chance to discuss it and have the chance to think about it during the weekend. Draw up a plan to release yourself from your responsibilities and give suggestions or advice to others who may be assuming your position once you’ve left. This will enable you to train fellow colleagues on your position and also make it easier for your boss to embark on the process of reassignment. Also if you deem it appropriate then you could offer assistance in finding a replacement or write a new job advertisement. Just be as helpful as you can. You can offer contact details such as an email address for your colleagues to contact you if they have any questions. This will give your team the reassurance that you won’t leave them ‘stuck’ after you’re gone. Writing a formal resignation letter isn’t a requirement for all jobs, but it’s part of how to put in your two weeks notice and just so that you and your boss can keep it in your records. You don’t have to go into detail as to why you are departing, just simply say that you wish to leave and when your last working day will be. Also remember to keep your resignation letter brief and factual. The purpose of this letter is to give two weeks’ notice of my resignation from [Company Name]. My final day will be [Two Weeks from Today’s Date]. It has been a great pleasure working at [Name of Company], however, another opportunity has arisen and I have decided to take it. I will complete the time I have left here with the same hard work and motivation that you have come to expect from me. I will be more than happy to assist in training my replacement or aid the transition process in any way I can. Thank you for giving me the opportunity and work experience. I wish the best for both you and the company. Leaving your current job for a new one is exciting but it can still cause you great stress and anxiety but try not to let these feelings overwhelm you. Use the last few weeks you have to organize your work space, clear out junk, your locker and also use it as an opportunity to tie up any loose ends. Saying your goodbyes to colleagues can be extremely tough but you can always offer to keep in touch. This may not seem genuine to the people you hardly spoke to whilst you worked there but for the ones that you did communicate with, it can be seen as a nice gesture. Clean everything on your desk on your last day. Literally. Make your desk look as spotless as it did when you first started. Also don’t forget to stop by at the human resources department and double-check that they have your correct contact details. Experts suggest that it’s necessary to take a week off of work before you start your new one as it helps you refocus and wind down before revving up again for your new job. After you hand in your letter of resignation, make sure you keep the same positive and hardworking attitude that saw you through to the point where you are now. Don’t slack just because you have two weeks left. Continue to make a good impression as it shows professionalism and could influence the reference you get.